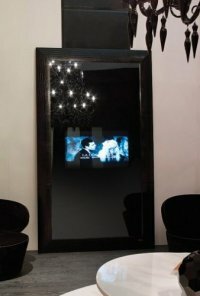 With everything getting converged these days, it makes perfect sense for the existence of the Fendi Casa Mirror TV Combo. This device is perfect for those who live in hamster-like homes that are so small that even Ikea doesn’t have a design that fits. Well, the name of it is pretty much self-explanatory – it is a standard mirror that works as one, at least until your turn the LCD TV on. Once powered up, the TV will reveal itself in various sizes (depending on your budget), maxing out at 42″. Perfect for those who are living in studio apartments as well as couples who want something a little bit different in their bedrooms.